H&M Dress Girls Size 3-4 Sleeveless Dark Gray. Condition is Pre-owned. Shipped with USPS First Class Package. I have two identical dress size 6-8 by H&M. Just pull over their head and they are ready to go. Made of cotton. In excellent condition. Navy blue color. Gold heart detail. I take one picture then list all of my sizes that I have. Lined with a red polyester lining. Great for a special occasion, or a flower girl dress. Authentic H&M girls dress. Size 7 girls. (Love it with fancy sandals as well as chill sneakers. many ways to style, all fabulous & fun :). Pullover lightweight dress with pretty black lace trim. SOFT AS BUTTA & machine-washable. Size: 10–12 girls'. Tulle dress with lining. adorable dress in excellent condition. 12" across underarm area. H&M Gold Unicorn Dress. Brand New. Made of a gorgeous navy blue Jacquard Weave. Very elegant and perfect for parties. All of the details are high quality. The jacquard fabric is gold on the underside. Crinoline lining peeks out of the bottom and adds volume. Another silky lining underneath for comfort. Zipper in back. Brand new and never worn. These dresses sold out very quickly. I bought it for my daughter for her birthday but she decided she doesn’t wear dresses anymore. IT'S PULL OVER DRESS AND IS GATHERED AT WAISTLINE. SIZE: 7-8, CHEST: 12" ACROSS FRONT, 12" ACROSS BACK. FABRIC: 100% COTTON. KIDS GIRLS GRAY BLACK WHITE BUTTON POCKET LACE DRESS. AND CUTE WHITE LACE AT THE BOTTOM. THIS DRESS FEATURES A GRAY BODY. WITH A BACK ZIPPER. POLYESTER 32%. LENGTH TOP TO BOTTOM: 22". COTTON 68%. KEEP YOUR LITTLE GIRL IN STYLE! Girls 14 or Small junior. P a y m e n t.
Beautiful dress for a nice occasion. True to size. Brand new. Wonderful fitted ribbed textured cotton blend dress in excellent condition size 4 stretchy fabric like new. Junior's Light Green H&M DRESS Sun Dress Beach 10-12? We will do our best for your order to arrive safely & quickly. This is a gorgeous dress from H&M. Button to the back. Fully lined. Excellent used condition! Length: 30". Armpit to armpit: 12". Pretty and light weight summer cotton vest dresses. Turquoise with flowers is age 5-6 from primark and white/navy is age 4-6 from H&M. Only worn on summer holiday last year so in great condition! Lots of other items listed or to be listed, happy to combine post. I can take up to 7 days to post after payment. 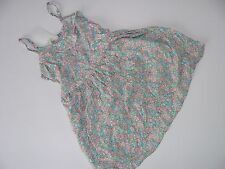 Girls H&M Mint Green Chiffon Floaty Summer Dress Age 10-11 BARELY WORN! Lovely Set of Two Girls My Little Pony Dresses BNWT. Will fit age 6-8 years. The dress is light grey in colour with an orange Aztec design. This is a gorgeous sleeveless dress from H&M. Excellent used condition! LOVELY SOFT LIGHTWEIGHT DRESS, WORN ONCE, AS NEW, IMMACULATE CONDITION. Girls H&M Black & Beige Printed Dress In size 8-10 years. Longer length at back. Iridescent pink sleeveless bubble dress. Labeled girls sz 5/6. In excellent used condition: no signs of wear. 50% polyester/50% polyamide. No stains or holes. 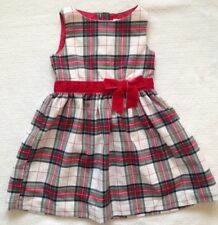 H&M girls dress. Length 28". Underarm to Underarm 12".